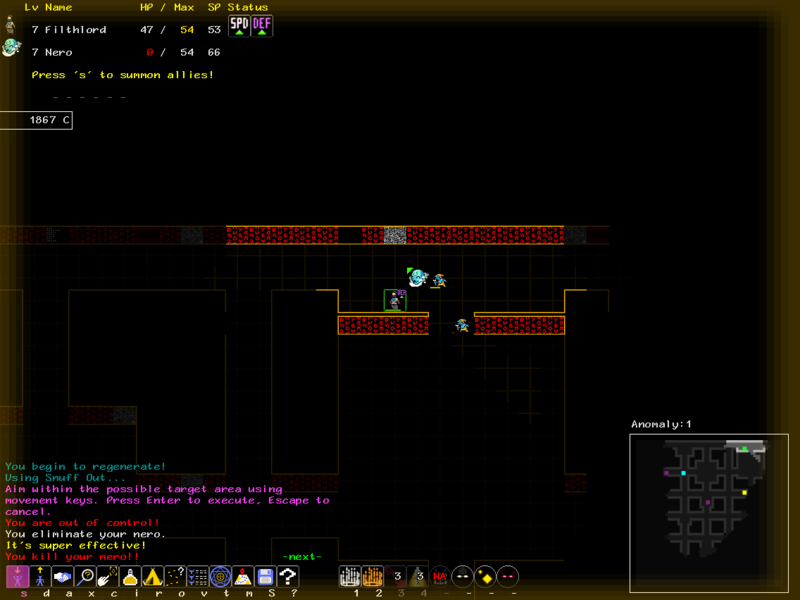 The forum for all things FerretDev.Org, including Demon, the monster-collection roguelike! Anyhow, I left probably the first Tower:23 ghost. It's heavy on the mind status spam, so beware. Not too much to say about this run- it started as a healing slash crown of glory, turned into leadership/wild Frenzy/crusader/Crippler build that mostly just supported nukers and spammed Charm. Was one of those builds that goes really well until you miss a few times with hits and status effects, then things can go bad fast. I kinda wish I had Far Summon so I could use Wild Frenzy without hitting my own demons, but unsummoning ones that got too cozy and then relying on Aux Power was good too. I did try the Aux Power though, and it worked well with the wild frenzy+leadership abilities, since I'd give my single summoned ally a few extra turns whenever I frenzied in the middle of an enemy pack, allowing it to Meditate a bunch, or heal me if Crusader wasn't working, or do something mean on its own. It also helped with certain links like Phoenix. I ended up with Aux Power II and Aux Guard I with Guard coming in last, because I thought it was more important to get Wild Frenzy doing better damage than it was to shrug off damage. Aux III doesn't seem workable for most builds, since you'd have no demons summoned and only be 'half' heroic, and I run into trouble occasionally even in full heroic links with an ally. One exception might be an Aux Power 3 build similar to the One Snuff Man build, aiming to instakill foes. n : Number of party members counted. * : Denotes the main character is included. Your eye killer receives Ritualist from Tlaloc! You delete Flash Shock from your eye killer! You receive Eternal Glory from your eye killer! You have too many abilities and must delete 1. You delete Parry from yourself! Your ya-te-veo rejoins your party!! Copy Eternal Glory to your ya-te-veo for 1280 C? Your ya-te-veo receives Calm from your ruler! Enter to execute, Escape to cancel. You use the ghost chime. ...but it passes after a moment. There is a shimmering portal to Victory here. Press 'p', '<', or '>' to change levels. game? If so, re-enter your summoner's name. Congrats on the ghost win. I'm happy you found some use for a build revolving around using only a single demon. Part of my reasoning in releasing Aux Power and Aux Guard available before you could actually max them was to encourage people to try "partial Heroism" out. Edit: Any comments on the changes to rare spawn rates? Aux power works well with the Snuff Out Build, naturally. 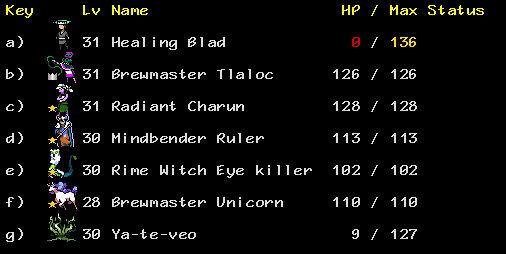 Died because I thought since I was hasted I had 1 more turn to summon before I turned to stone, I didn't. I may be too lazy to check status lengths but they're a nice feature. I had vague plans to go for Exterminate but I think that's only in tier 3 body modifier, and it doesn't work with Exorcists/Demon's mien, so this was probably better. 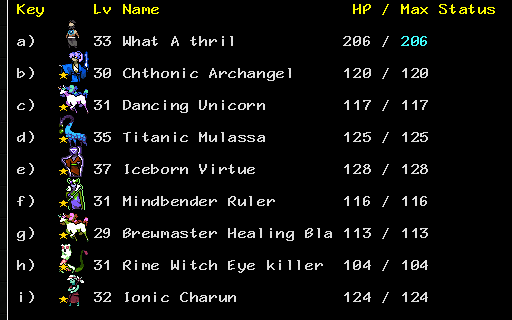 Though unpleasantly vulnerable to status induced deaths, I was doing fairly well with Ninkasi as healer, buffer, debuffer. She didn't have the mana to do all that forever of course, but that was fine because most enemy packs had a # of rounds to live = to # of enemies in pack. Dreamstalker would presumably allow me to kill anything except maybe a hero, but Blue Whisper was my only access to it. Before her, I mostly used a basically unmodified Fetch to apply Expose and to drag MaxHP of certain enemies down into Snuff Out range. Expose+Might are really necessary to let you kill things that aren't Light/Dark vulnerable. 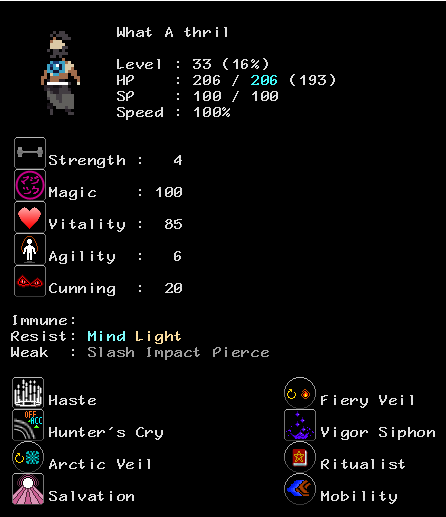 Exorcism killed light vulnerable stuff in a single blow, which was nifty. Status icons are one of those things I always look at and ask myself two things: 1) Why did I wait so long to do this? 2) How did anyone play without this? Well okay, the first question isn't a mystery: I hate UI But the second is still unknown. Aux-powered Snuff Out is probably going to be a popular variant of Aux-powered Summoner once Aux upgrades are more readily available. I think will prevent it from becoming cookie-cutter will be the a demon debate: proper Snuffing Out requires a fair bit of set up that is much easier to get done quickly if you have demon helping. What demon that is, how they're setup, whether or not you keep them around after setup for backup healing or unsummon them to get 3rd tier Aux bonuses... I hope these questions keep interested parties busy for awhile once the upgrade build is out. Glad to hear the rare spawns seem properly rare again. L24 is still not a bad run, even if it's not a win. Thanks for the report! did an actual win for once because there was nothing too interesting about this character worth turning into a relic wraith. 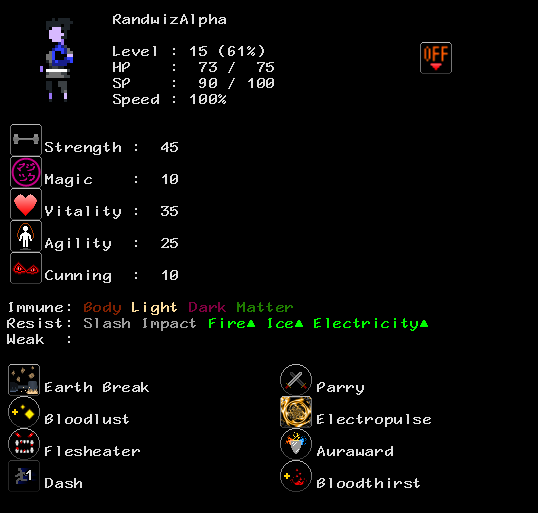 Buff big attacks and cycling through lots of demons, basically. 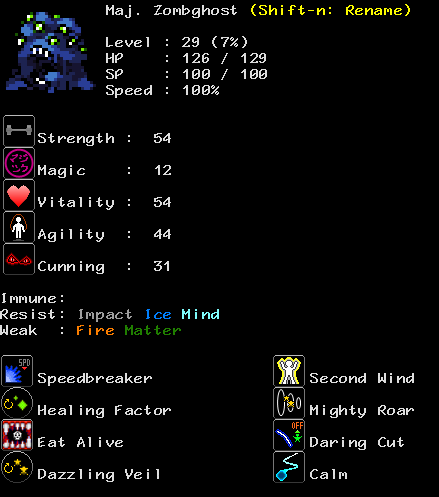 I got a Headless from a summoner and used this shoggoth for a fair while, only getting rid of it on the last floor in favor of the Ionic Charun looted from a ghost. Also had Miadchaoin but eventually deleted him after getting the roar. Or maybe he and turdak died somehow? 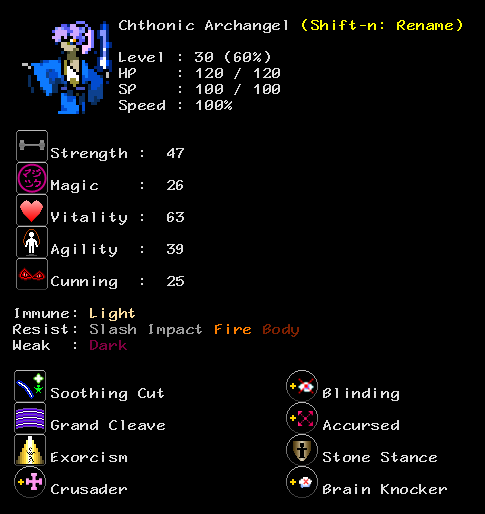 I actually used a Chthonic Ruhin for a long time, with accursed and tangler and Wild Combo, but eventually 'upgraded' it into an Archangel that lasted me for the rest of the game. 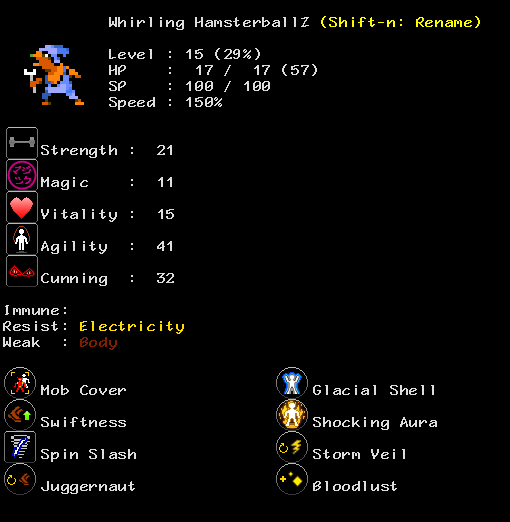 Probably shoulda swapped blinding for crippler but oh well, I was plenty powerful already. Assisting my Archangel for a long time were a Destroyer Bonnachon and a Lifebender Bonnachon, who I recruited after I noticed my demons were getting underleveled. Melting sure seems better overall than ignite and poison, and stacking them all up really ruins the day of any pack without healers. As a counter to Dark packs, this Frenzied Jinn served me well, though it would have died even sooner if I hadn't had quick dismiss. My big lategame star was this Titanic Mulassa, made from a Titanic Charun I got as a consolation prize after I accidentally killed Ogun. I had vague early plans of maybe becoming a veiltank or getting some debuffs, but eventually just stuck with the tried and true buff support with maxHP drain to kill otherwise unkillable things like Tremane or the Tanky ghost I fought plus mobility to scoot around fast. 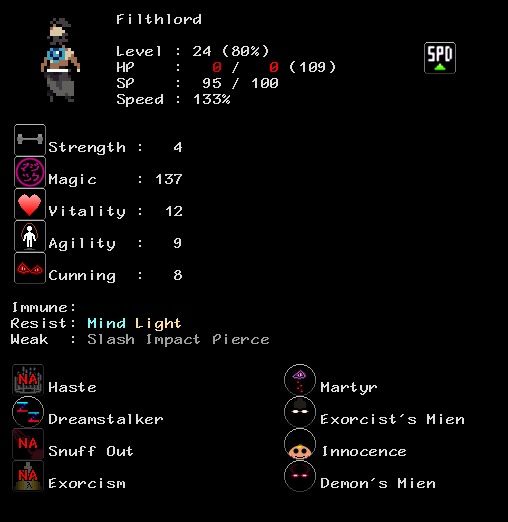 I went through all sorts of abilities before finally settling on Salvation- that slot had blight, the 5sp energy drain touch, bravado, witch's mien. Salvation was really nice since I had ended up with such a holy party when fighting my ghosts, though. If anything I'd say the veils I did have were encouraging enemies not to attack me in melee as much. Yup yup. I played this game over the course of a few weeks rather than my usual 1-day mad dash. I still felt rich without recycle, but recycle is still nice for getting over a perceived early-mid game lust for credits in the anomaly-turdak area, where I want to make fusions from my early uniques and/or any rare demons AND get player skills online AND really train up some demons. The archangel is still charmed! Your archangel slashes the archangel. You sap the archangel's vigor! Your ruler gestures at you. Your archangel misses the archangel. Your archangel kills the archangel!! Your archangel's speed returns to normal. Your archangel's power returns to normal. Your ruler's speed returns to normal. Your ruler's power returns to normal. Your power returns to normal. You swap places with your archangel. You swap places with Healing Blad. Heya wizzz. Congrats on the win! Melting vs. Ignite vs. Poison do have some subtle differences. Melting and Ignite both block HP regen in addition to the damage they deal, but Melting is a full duration effect while Ignite is, in most cases, fairly brief. Poison doesn't block HP regen, but can stack instead. If you only land one hit of each on something though, in most cases Melting will come out ahead. They definitely can ruin the day of non-healer groups pretty quick when stacked, no argument there. For some reason I am amused by the mental picture of an archangel wandering about with two strangely colored (due to their modifiers) cows, conquering the Tower. I think the upgrade revamp and the subsequent much, much higher cost on Quick Dismiss is probably going to be a good thing for the game. I probably underestimated just how powerful it makes summoners, especially with a large stable. I could just nerf it now, but I don't like half measures, if I'm going to do that, I need to provide other, more balanced options to compensate. Hopefully the next build's bucket of abilities will provide some new options to play with. I need to add some passives too, in addition to all the actives, since those tend to be where the new build options come from. Congrats again on the win, and thanks for the report. First off, I like the changes to relics a lot. Now it feels more like scrounging up good stuff early on rather than facerolling everything with your starter abilities. That said I also found Earth Break on like the first floor and used 3 tempest rooms to get the Oni from Rush's sanctum so I was facerolling plenty. 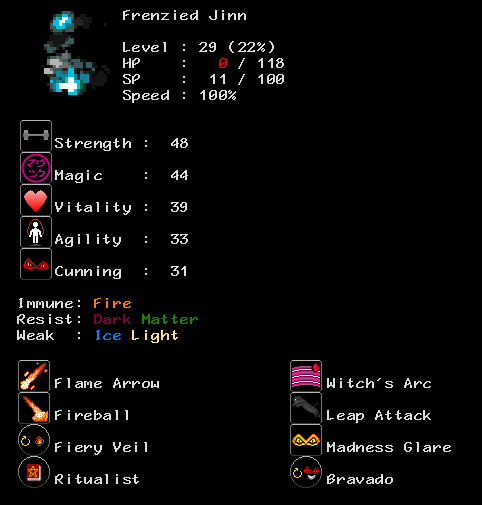 Demon preservation isn't as overpowered as I thought it would be- it takes a LONG time to get back from 4maxhp through XP alone and pure stones aren't infinite, so. And it's nice not to lose a demon completely because you weren't paying attention, of course. Recruiting identical demons doesn't change much apart from very short-term fights where you nned to link with more demons but can't bear to delete the one you already have. Since you don't actually want a group of identical demons(probably) I don't think there's any worry of it being overpowered, but it does have the potential for amusing shenanigans with mirror chimes and so on for sure. The shikigami smites your nero. Your shikigami smites the raiju. The raiju is no longer charmed. Your hob gestures at the raiju. The ala blinks towards you. The ala looks refreshed. The ala consumes life. The ala drains your nero. The ala drains your hob. Your nero will be a pariah longer! Your relic struggles to keep you alive! Your shikigami scourges the raiju. Your nero gestures at itself. You are no longer shocked. You miss the raiju. (x2) The raiju misses you. The raiju feels less guilty. You parry the ala's attack! Your shikigami gazes at the ala. I'm glad you like the relic changes. I admit I was pretty nervous about them. I believed they were the right move for the game, but I didn't know how well they'd be received, particularly by longer time players used to the old options, especially the overpowered (::cough:: Frost Ring ::cough::) ones among them. Anyway, I'm glad you had fun. Thanks for the report and feedback! P.S. : HamsterballZ is a hilarious name for that color of gremlin. I hadn't seen that before, it does indeed look hamstery. New consume sure is interesting. 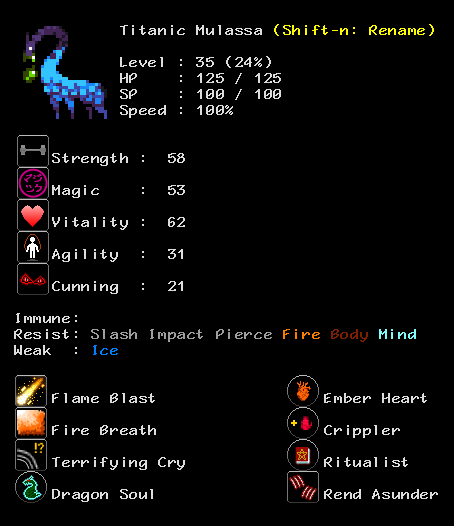 I kinda wish there was some way to consume then delete with fewer clicks so eating every incidentally recruited demon would be smoother. 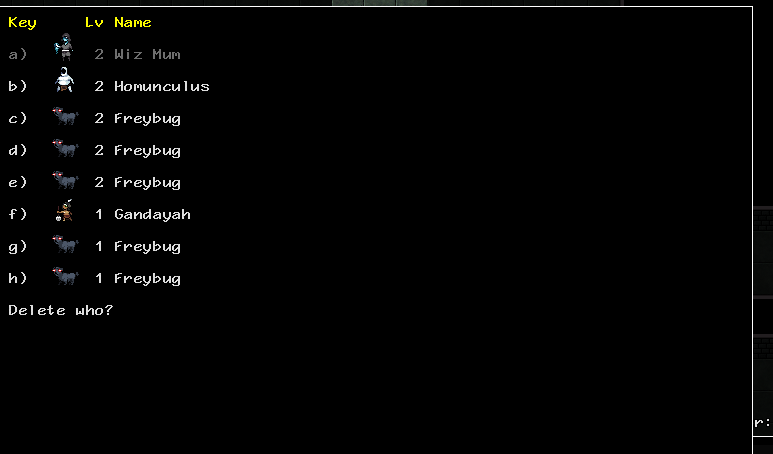 Maybe if deleting also auto-consumed if you have both upgrades? Yeah, I probably will automate Consume in cases where it would be possible and of no detriment to do so.